Monday: Off for 12 days. Time to catch up on a few things. Barbara’s spinning class at West Kirby and then the gym. Ran a mile at 10 km/hr, cross trainer and intervals on the Technogym side stepper, weights shower and home. 305 Course question about this weekends Cheshire Cat. It’s on BikeHike. Started to sort the flat out which dragged on to 7 with another trip to Wickes. Quantum of Solace £7 in Tesco but not on BluRay, grrr. Tuesday: More of the same. Spinning class at West Kirby, more work on the flat and it looks like I have missed the good weather. Booked an X bike class at Guinea Gap for 7 so dining late tonight. This weeks ride video were New York and San Francisco, only being part of the class the rest being instrctor led. Saw Lances twitter about picking the Times up and there being nothing in it about Mark Cavendish,s Milan San Remo win. Radio 4 picking up on it. Plenty of press about him crashing and breaking his collar bone. Managed to get Stans Horseshoe Grimpeur into the Edge after a bit of work. With two climbs of the Horseshoe pass and a lot more it will test anyone. Haven’t worked out if I’m off or not. Wednesday: Ride day delayed due to a call system fault. Winter bike and a water proof jacket out to the Eureka with only Merseyside CTC (who start late) and Keith Boardman left. They had been to the Plassey too and had a tale about it. Home via the missing link but diverted on to the Wirral Way as I’d never ridden the Hadlow Road section. It’s all hard surfaced to Heswall now with no mud or puddles. Left it at Parkgate and stopped for some water. Then it was back into the wind with the Edge showing 7.5 mph at one stage. 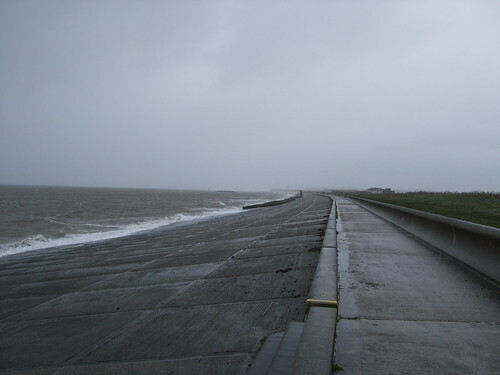 Then it started to rain and this was a cue to take the Wirral Way again by the Boathouse. 18 miles, should have toughed it out as it turned out brighter later and Eurosport dropped the Track champs. Thursday: Car is getting a new cambelt, bikes going in the back and going to treat it as a ride day. Too risky not to change the belt when you’ve heard a few horror stories. Dropped the car off and headed off along the front at Hoylake. Not many people about but it was early and blowing a gale. Vale park Cafe was closed with Woodside closed for refurbishment. Looks like they are doing a good job of the U-Boat there. Called in at Europa pools to see what spinning classes are on and the good news was that Louise has started doing her classes this week after beaking her leg on a run. Out via the Missing Link to Ness Gardens for a Cafe stop, the rain clouds blowing over the Dee meant it was time to move on. I’d stopped to take a picture on Denhall lane and virtually had to ride downhill the wind being that strong. 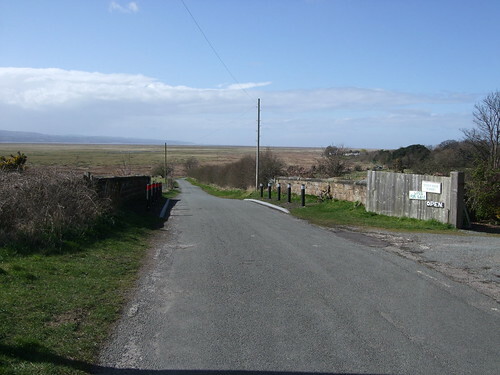 Took to the Wirral Way at Parkgate and followed it through to West Kirby. No phantom tacker this time. The Council were doing work on the track at Thurstaton and had left the gates open. Next thing a car is going down the Wirral Way with a kid asleep in the back. His reversing better be good as there is no way of turning around. Picked the car up from Hoylake put the bike in the back and gave it another clean when I got home. 45 miles not a bad day after all. Bike chain went in the ultrasonic bath for a clean as although there is no spray from the front guard the rear guard was pouring water over the chainset on the wetter parts of the morning. The goldline chainlube is not attracting the grit like the oter lubes. Pauls Twe2.com backup and running with a load of texts coming through wishing Lance Armstrong a quick recovery. Watched the World Track Champs on Eurosport and Team GB is not having it all their own way. Friday: Easy day, read “It’s not about the Bike” until I had to put it down to go to the cinema with Val. Watched “Knowing” but felt shortchanged by the ending. World Track champs on Eurosport when I got home and refitted the chain to the winterbike. Twittered a bit too. Saturday: Sorted the flat out, no ride. Sunday: Antony Gormleys “Another Place” was busy but you couldn’t see anything as the tide was in. Barbara’s Spinning class at West Kirby. Thanks, Simon it is appreciated. It’s been a mixture of diet and exercise. The diet is pretty fixed now but the exercise helps out if there are any deficiencies in it. I had a Quality Street surplus over Chistmas and it is proving hard to shift. A coupleof big rides will have me sorted though. Previous Previous post: What it takes to lose a Pound.